Lift this leg up, that arm down--move him all around. Correctly proportioned manikins are essential accessories for the studio artist. 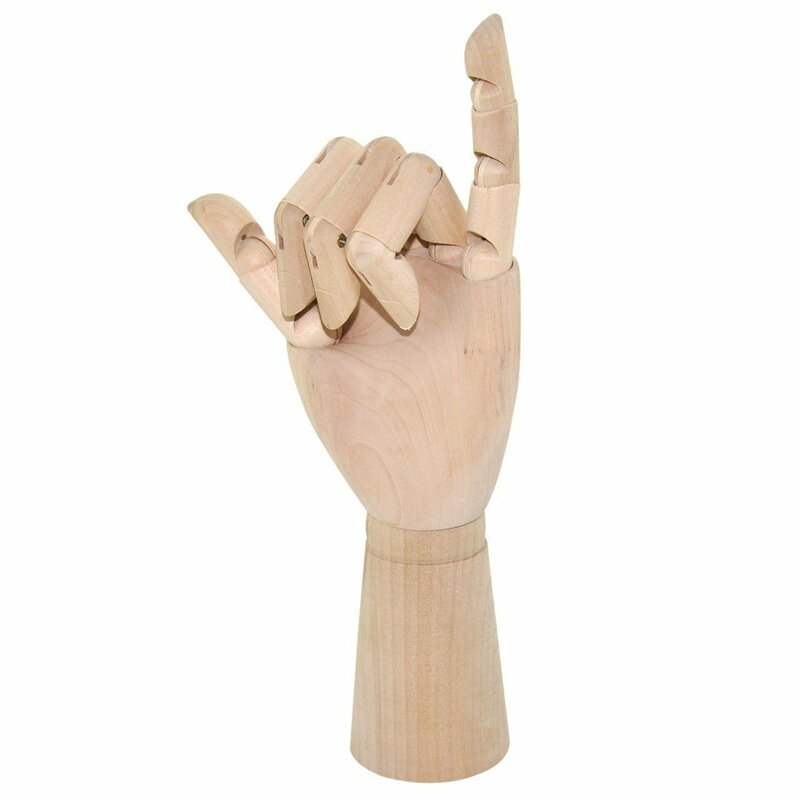 16.75-Inch (42.54-centimeter) accurately proportioned manikin provides an excellent drawing aid. 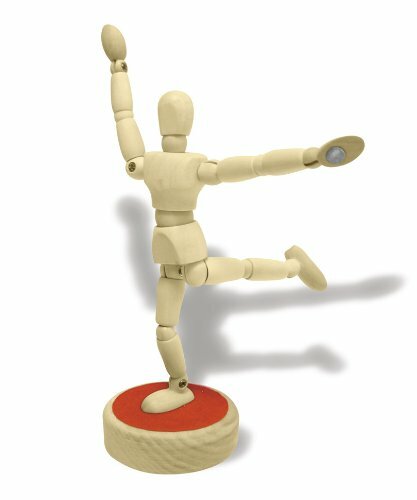 Figure comes on a stand and is jointed and moveable to match most human positions. Stand and figure are made of unfinished hardwood. Although this doll is well made, it is not proportionate. In addition, the legs only move front and back and not left or right. The torso is NOT what is pictured. It is a series of 8 flat discs about 1/4 in length and this elongates the torso while making it hard to bend forward or backwards. Being a beginner and just starting out drawing the human form, this is very limiting in actually translating it to a drawing. If it was just one thing, I might have given it a four star, but there are just too many limitations to this model. C. The paper to the right shows what the proportions are supposed to be and how far off they really are on the mannequin. 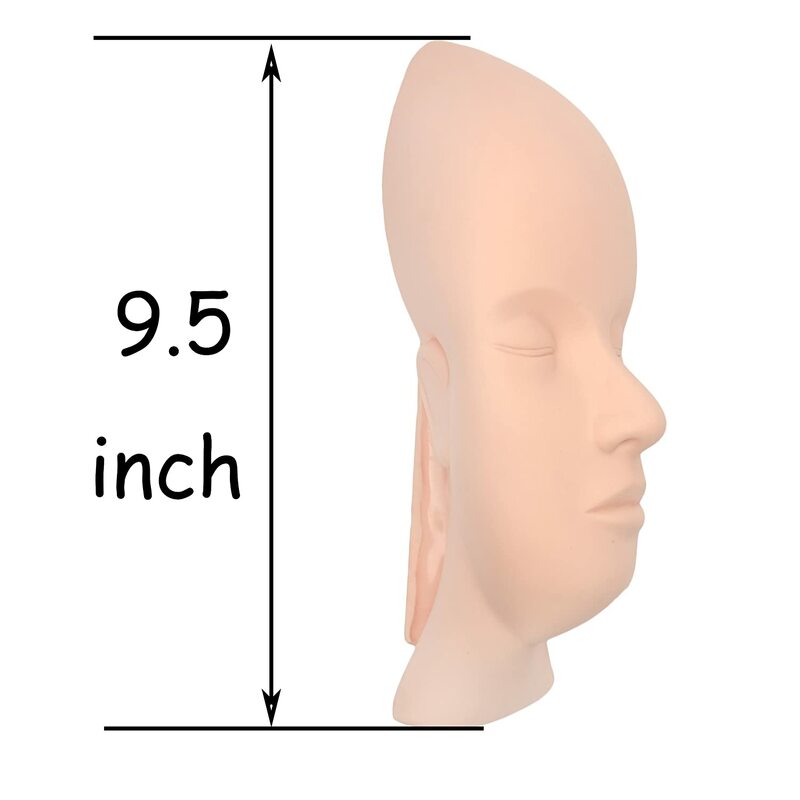 Manikin arrived VERY quickly, is perfect for modeling quickly and teaching/learning. If you need better proportions you should be prepared to pay a LOT more. I've attached the bottom to a flat square of scrap metal to keep it from tipping, which is typical of this kind of manikin. A friend of mine ordered her own and when it arrived she attached a cheap Home Depot tile with some wood glue, very easy. Cost her less than a dollar, but I like that mine is unbreakable. Either way it solves an inherent problem with these manikins, if it bothers you. We are both very happy with our purchases and I plan to purchase a few more as presents for students who like to draw. I was surprised to find that an artist's model could not move its legs akimbo. Only forward and back. This model also did not have strong articulation- poses sagged after a few minutes. When I took the manikin out of the box, it was not like the one I ordered Does not look like the picture at all. It has like an accordion torso and it is hard to bend to the sides, and when you bend it forward, it falls over. I am very disappointed. Well, I guess you get what you pay for. I thought this was a reasonable cost, and i suppose it will do in a pinch. The proportions do seem a bit off - and I just completed a graphics project where I needed a figure posed in a particular manner and, now that I have it fleshed in, I am not that happy with the arm and leg lengths. I can adjust for future projects, but I should not have to. So that accounts for one star down in my rating - the second star was forfeited for the range of motion. I was hoping to be able to achieve some natural poses, but the arms only go up so high, and the torso and hips are very limited in their achievable angles. If this were a person, it would not be able to put its hands on its head or pick up anything it dropped on the floor. Maybe there are more expensive manikins that move better - i will have to research that. It was the size I needed _ very hard to find; however, the front of th= lower torso protrudes too far, and the legs are not correctly connected - too close together, and therefore imbalanced. I am using it without the stand. It would be nice to find a mannequin that size that doesnt have this issue, something that is anatomically correct. Over all it is crafted pretty well and has good limb connections. One of the only minor problems I saw was that when the arms and legs are extended the figure tends to want to tip over. Also some of the joints seemed to have a limited range of motion; but, can be broken in with use. It was worth what I payed and I'd recommend it to others. It's a good starting point for an up and coming Grandkid.. Kind of cumbersome and somewhat difficult for small hands to pose, but still a great value. I'd recommend it. Jack Richeson 710113 12 Female Manikin Jack Richeson & Company Inc.